Meet Jules. Having lost 11% body fat and 7.3kg everyone at UFIT who has met him has been inspired by his journey, and the changes he has made to his life, after training with @Lrj_oneill and being supported by UFIT Nutrition. There’s no one size fits all. For a sustainable approach to Body Transformation, we believe in the Power of Community. So from now until 14th February, when you sign up, bring your friend or partner and they can train with you for free! Here are the top reasons why training with the right personal trainer can give you results beyond your expectations. Should you exercise when you are pregnant? 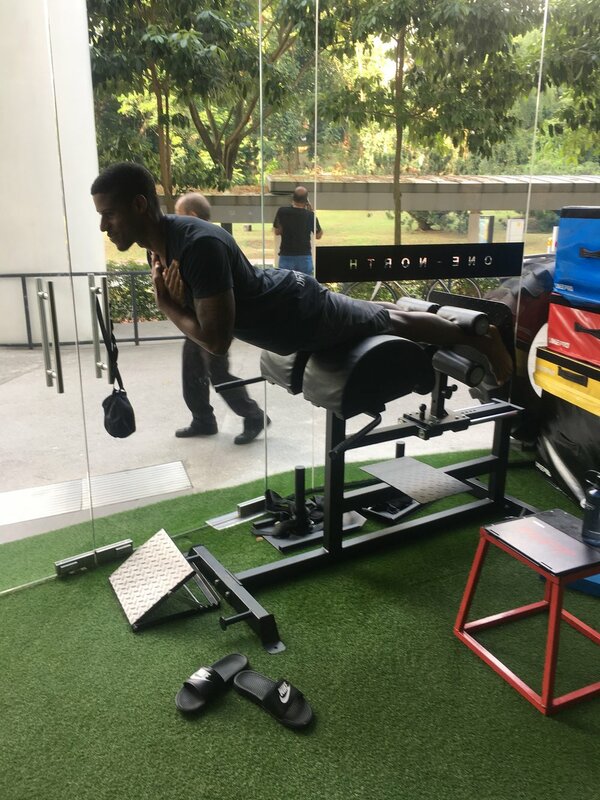 Fighting sports have become huge in Singapore over the last few years with the rise of the one championship, KBX fight promotions, and specialist boxing gyms opening up. Whether it's martial arts, Bootcamping, CrossFitting or PT you do - and anyone who works out frequently - puts their muscles and joints through intense loads. Don’t get me wrong, this is not a bad thing at all and with enough time to adapt, your bodies will benefit significantly from the increased demand. However as with any contact sport, there is no shortage of injuries. In this article I'll outline a few good ways to avoid any hip injuries from martial arts - or any other rigorous training. I’ll also give you tips and show some simple exercises that can reinforce your hip and the surrounding structures so you are less likely to be injured and need physiotherapy. After all, prevention is better than cure! Ouch, I’ve had a few, usually by throwing a flashy kick too high without warming up or pushing it too far whilst stretching with a partner and pulling my hamstrings. Muscular strains are very common and the majority will clear up in 2-6 weeks if you do the right things. Please note it's important if you have any ongoing or recurring hip issues that you get them assessed by a physiotherapist ASAP, there are many different structures that could be at fault. Load up gradually – in other words don’t jump from sofa to sparring in one day, if your body is not conditioned to the stress you are about to put it through you’ll increase the risk of injury. This goes for returning vets as well as beginners. Make sure you are warm – OK this might be a given but you’d be surprised how many guys think doing a quick jog up and down the room is enough. Get your blood pumping, get those neurons firing and do some dynamic stretches before you start. 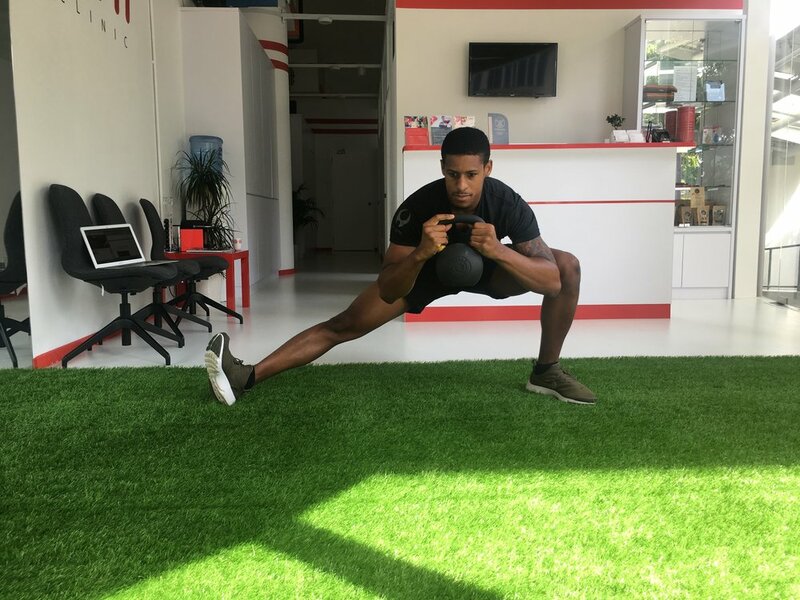 Increase your hip mobility – This is important in all sports but extra important if you like flashy kicks, or intend to roll with someone who is going to try and pull your legs to the opposite sides of the room. Supercharge your leg muscles – Try out the exercises below to supercharge your hip. Start in a long lunge position, with your back leg completely straight. Put both palms on the floor in line with your front foot. Twist towards your front leg, lifting your nearest arm up to point towards the ceiling – your body should end up facing your front leg. Repeat 10 times each side. Start by lying on your back, with one knee bent foot flat on the floor. Grab one leg and pull your knee in as close to your chest as possible. Push up into a bridge with the leg still on the floor and hold for 5 seconds. Repeat 15 times each leg. As below but without a weight. Grab a kettle bell or a weight – doesn’t need to be too heavy you are using it as a counter weight so you can sit back into the squat. Sit back into a squat and push your elbows against the inside of your knees to push them out. Hold it and gradually sink lower into the squat as your muscles relax. You can do this one of two ways depending on your current flexibility. Lunge down to the side keeping both feet facing forwards and holding the weight in front of you. Sink lower into the position each time. Push your bottom down and backwards. Repeat 5 times each leg. This exercise is for advanced only, please make sure you have sufficient strength in your hamstrings before attempting this. The main focus of this exercise is on the lowering phase known as the eccentric phase. Get yourself into a neutral pelvic position and brace your core muscles as if someone is about to hit you in the stomach. Repeat 3 sets of 4 repetitions. That’s my top six to supercharge the hip, I hope you enjoyed it and good luck trying them out. If you are interested in learning more handy tricks and exercises to help you stay injury free follow my instagram @thefightingphysio I am also available for consultations, treatment and advice at the UFIT Clinic one-north. 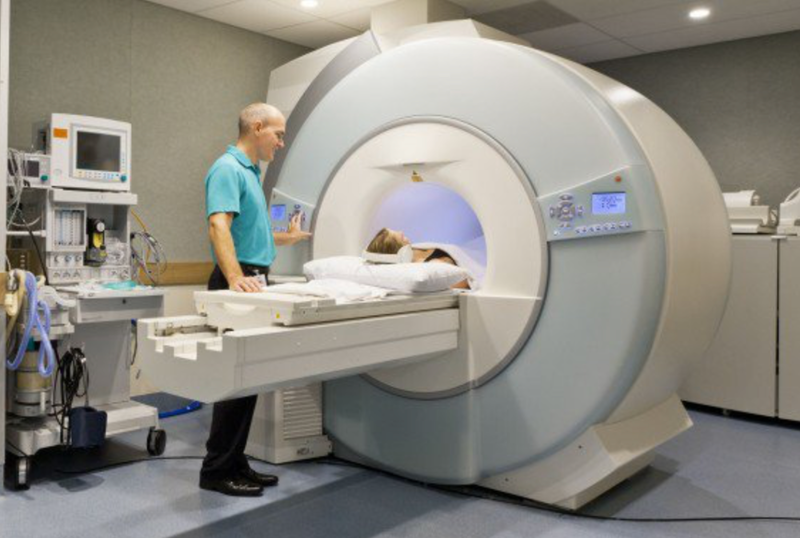 MRI scans - are they necessary? As a physiotherapist in Singapore, I see two things very often: patients with back pain, and patients with recently acquired MRI results (usually the same people). Why? Well, the prevalence of back pain in Singapore is often because the patients have combined a high pressured, desk-bound job with a lack of exercise and movement in their daily lives. This is because in Singapore, as in most of the world, MRIs and related high-tech imagery have ballooned into a multi-million-dollar industry to both the providers and the referrers. Indeed, in the United States last year, Medicare paid out over $14 billion dollars for MRIs alone. The Truth? MRI scans are surprisingly difficult to read, and different radiographers looking at the same scan will often report different findings! The Truth? Issues found by an MRI scan are often completely misleading, can have nothing to do with the pain you are feeling, and can be a completely normal part of ageing. Let’s dig a little bit deeper. So how accurate are MRI scans? A very recent study conducted by Herzog et al, published in the Spine Journal in April 2017 assessed the accuracy of MRI imaging and reporting, by asking a 63 year old patient with current pain, and a long history of lower back problems to visit ten different MRI centres in succession, and get a report from each one. The results? 0 of these ‘issues’ seen across all 10 scans. This is a scarily clear demonstration that MRIs are not the clear snapshot that patients often believe that they are. So why is there a difference between different MRI centres? First of all, like with physiotherapists, you can get good, skilled radiographers, and you can get inexperienced or under-skilled radiographers. Secondly, just like your TV and computer, imaging technology is constantly changing and improving. So an Ultrasound or MRI machine from 10 years ago is going to be very low quality compared to a machine produced in the last two years. Finally, an uncomfortable aspect of the medical industry: many doctors now own their own imaging machines, and will charge a premium for potentially unnecessary scans to ‘confirm’ their diagnosis. Is there anything a patient can do about this? Not much besides trusting your doctor to refer you to a trusted imaging centre, and hoping for the best. Are MRI scans even relevant? In most cases, no. A large systematic review conducted by Brinjikji et al, in 2014, assessed the MRI findings of 3,110 people with No Reported Back Pain. The findings? A significant number of these perfectly fine people were found to have problems, issues, or ‘degradation’ within their spines, which became more common as they got older. One third of normal, healthy 20 year olds have ‘degenerative’ signs in their lower back! And two thirds of perfectly healthy 50 year olds were found to have disc bulges! So what does this tell us? Spinal changes are a NORMAL part of ageing. Disc changes are a NORMAL part of ageing. And more importantly, negative changes in your spine are not always associated with pain. Does this mean we should just throw all MRI machines in the Singapore River, and never speak of them again? The good news for you as a back pain patient in Singapore (or anywhere else in the world)? Even if you have MRI findings that say that you have disc bulges, disc degeneration, and all sorts of issues going on – it is not a death sentence, and you do not need to go under the knife to ‘fix’ the problem! Find yourself a good physio (quick plug: we have great ones at the UFIT Clinic), or a good doctor (ask us, we know many!) and complete your assessment with them to see what other factors might be contributing to your pain, and what we can do together to get you back on your feet, and back to being fit, healthy, happy and pain-free as quickly as possible! “The real purpose of running is not to win a race; it’s to test the limits of the human heart.” This is how American track and field and co-founder of Nike, Bill Bowerman, described why we run. What an outstanding description of a sport that sees over 16 million Americans doing at least three times a week! Running is the fastest growing sport over the last decade with an increase of 300% in participation noted since 1990 in the US alone. Within this statistic we see the greatest increase in female runners where 25% of all runners were females in 1990, compared to 57% being recorded as female runners in 2013. But what is behind this phenomenon? Why are people, and females in particular, falling in love with a sport that historically has been hated. Why? Because running is an addiction, often a love/hate addiction, but a highly empowering and freeing addiction. We often hear people describe how they “caught the running bug” and that’s exactly what they are talking about. Once you find running, it becomes your stress reliever, your fitness regime, your “me time”, your obsession and your passion. This is why runners call themselves “runners.” They see themselves defined by their sport, unlike most other sportspeople who play a sport, we (runners) are our sport. Having said this though, most runners fall into running, they don’t necessarily choose running as their main sport. I don’t think young athletes look at professional middle distance runners with dreams of aspiration, when compared to premiership footballers, swimmers or tennis players. So it is often by chance that most middle distance runners find themselves addicted to running, myself included. I was always an active child running around, and growing up with 5 older brothers made sure I was able to run (away) fast. I started playing Irish sports in school, as most Irish children do, but not loving any particular one. This saw me embark on high school with no involvement in any organised sport which a teenage girl is probably the worst position to be in. So many changes are going on inside a teenage girl in terms of emotional and physical changes that I needed an active outlet. So at the age of 15 I simply fell into running because two girlfriends were keen to run for fitness. We then campaigned to our school to allow to employ an athletics coach and the rest is history. My love for running just grew and grew the more I ran, it wasn’t planned nor was it an aspiration of mine, but now I could not imagine my life without running. As my love for the sport grew, as did my running success. Racing and competing became my drug. Even to this day, the adrenaline rush and natural serotonin high that I get from racing is like nothing else. It is this high that is addictive and makes me want to run again and again, even sometimes foolishly through pain. This is why running is such a rapidly growing sport, this natural high and sense of empowerment, freedom and adventure is hard to find elsewhere. You are in control of it, you can run as fast, as slow, as hard or as long as you want. It is just you, your thoughts and the road. As they say, success begets success, and this is very applicable to running. Once you race or compete for the first time you then strive to beat your personal best time/placing and this is never ending. That’s what I believe Bill Bowerman meant when he described the purpose of running as testing the limits of the human heart. Testing yourself time and time again, and seeing how far you can push your body’s limits. Pushing yourself to be the best version of yourself, the best runner within yourself. To those non-runners that I chat to I always say don’t knock it until you try it. That natural high I get from running, just me, the wind and the road, is a sensation that words don’t do justice to describe, you have to feel it. Experience it first hand and see if you can resist doing again and again, because I know that for this reason I will keep running for as long as my legs can carry me! Máire began her career as an athletic therapist and trainer. Whilst in university she completed courses in trigger point release, kinesio® taping, massage, muscle energy technique and myofascial release to name but a few. If you're suffering from sporting injuries our superstar runner Maire is also an outstanding physio at the UFIT Clinic.